There’s a fine line between nailing the details of a concept and going overboard with gimmicky kitsch. Luckily for Botanist, the new primary restaurant located inside the posh Fairmont Pacific Rim, they are keeping it really classy with their nouveau dining room, champagne lounge, and cocktail lab. Botanist is replacing Oru, which shuttered for renovations just after the 2016 Christmas holiday season. Oru, which always offered impeccable service and delicious Pacific Northwest-inspired fare, just never caught on. There was zero buzz for Oru, and while they turned it out for holiday spreads, and kept hotel guests happily fed, outside the Pac Rim, no one gave a damn. And for a hotel as chic and attention-grabbing as the high end Fairmont Pacific Rim, it’s a crying shame they didn’t have a full-service b-l-d restaurant to match (though, to be fair, they knock it out of the park with The Lobby Lounge, RawBar, and Giovane). Enter Botanist. It’s got meticulous branding, and just enough special touches to stay safely on the side of “high concept” rather than gaudy scenery. True, the Champagne Lounge, with its exclusive pours, has a target audience that doesn’t include most of us mere mortals, but it is nice to have upwardly mobile goals. Customers being led to their tables will pass by the bar, which has what seems like as many cool compartments as a ship. You’ll instantly want to find five friends to agree to book the bar’s sole table, which comes with its own curtain and (glass) walls, so you can drink in relative discretion. If you nab a stool you can bear witness to all sorts of wild creating going on at the bar itself, or just off to the side in what they’re calling the Cocktail Lab. This is the playground of award-winning bartender Grant Sceney, who oversees the Pac Rim’s cocktail program, and Head Bartender David Wolowidnyk, who are like giddy kids on Christmas morning setting up their new toys. The Cocktail Lab is probably–likely definitely–the most well-equipped modern drink-making space, with high-tech appliances, gadgets, and vessels ready to make boozy magic–we’re talking glasses that are birds standing in nests. Remember when it was novel to have your drink served in a souvenir boot? Yeah. This is pretty next level, though you can’t take the birds home, sadly. Keep going, past the white baby grand piano, and drink in the dining room, which branches out to include airy terraces, and a meticulously curated explosion of greenery inspired by native regional plants. The walls are a feminine pink, and while it is breathtakingly chic and modern, it also has that luxe yesteryear vibe that once oozed from the columns and greenscapes of department store atrium restaurants. An s-shaped banquette island faces a sweepingly broad open kitchen, windows peek out at the inlet beyond glassy towers, and the smell of buttery bread lingers. This last bit is thanks to the open “bread station” where you’ll see rows of perfect tiny lunchtime roll-size square loaves, and signature dark green cardboard boxes for the full-size loaves of brioche you’ll want to take home. And butter. A giant mountain of butter atop a wooden plate that I dare you not to fantasize dipping your finger in. Restrain yourself. While Botanist does do breakfast (it’s a hotel, after all) and will add brunch in the coming weeks, lunch is an elegant affair at which you can linger or make haste, thanks to a menu split into sections like Graze (starters, salads), Hook, Hunt & Harvest (mains), and Botanist Means Business (a rotating special of two or three courses meant to get you in and out in a timely manner). Dinner at Botanist is a similarly divided menu, though rather than “mean business” and pack you off to work, instead diners can select “We’ll take it from here,” and let the kitchen drive for a tasting menu experience. Executive Chef Hector Laguna is putting out elegant and approachable dishes that celebrate the bounty of the region and the flavours of the season, and despite the emphasis on theme and branding at the restaurant, the food never seems too high concept itself. Dishes gently tug at boundaries, but keep it tidily reigned in and wholly satisfying. With opening week aligning with the arrival of spring and its seductive fresh ingredients, Botanist has morsels like a shockingly bright green English pea soup loaded with delicate Dungeness crab, roasted halibut, and a salad of roasted root veggies that awakens tastebuds to springtime with fava, garbanzo, lemon, and cheese (burrata at dinner, gouda at lunch). Look for a delicate beef tartare with a golden-orange yolk and a trompe-l’œil parmesan foam meant to be eaten off slices of grilled sourdough bread. Tender slices of meat are hugged by veggies prepared with light hands, a toothy freekeh, and a velvety taleggio sauce. 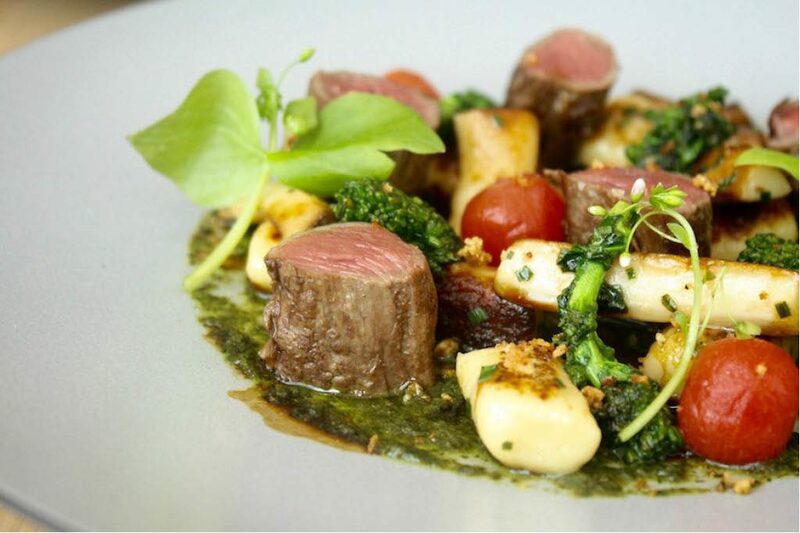 A lamb tenderloin special is plated like a forest floor without being overly precious (thank you). Dessert is understated here; it’s a trim selection, and nothing too heavy, too sweet, or cloying is on offer. There’s a lemony polenta cake with a buttermilk ice cream and punchy little balls of tangy apple, or a fluffy beetroot cake with gewürztraminer gel and elderflower frozen foam for a trifecta of earthy, sweet, and gently floral. Botanist still has a few details to work out, like adding the aforementioned brunch, opening up the terrace for dining, and some finishing touches in the Champagne Lounge, but if there’s anything Botanist can do is nail the details. To be honest, one of my favourite moments of my visit was when I was in the washroom and realized they were playing the audio book of Amy Stewart’s The Drunken Botanist, which barman Wolowidnyk says is practically required reading for the staff. And so it’s happened: Fairmont Pacific Rim has a restaurant with buzz that is not only getting hype, but that’s also totally worthy of the hype.